I hope you're not getting tired of my Holiday nail art looks yet because I have a few more to share with you before the big day. Today's look might be a bit familiar to you since I've recently used the technique. Anyone remember my stamping with holo powder post? Well in that post I mentioned a nail art look that I had in mind and now I'm finally able to share it with you. 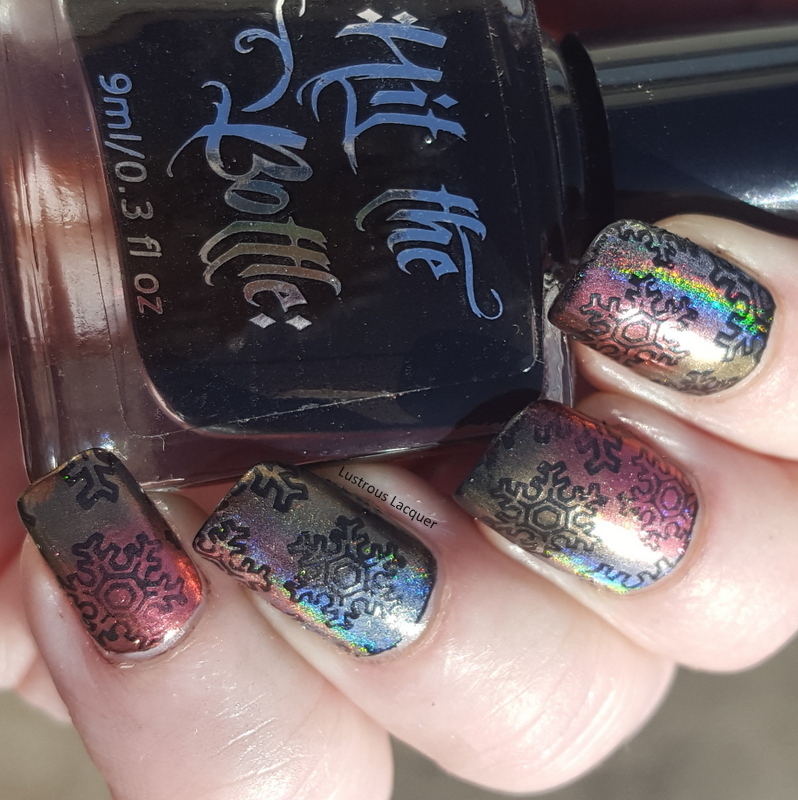 I have to be honest here and let you know that I didn't think through each step thoroughly before starting this manicure and it's not exactly what I had in mind so you will probably see this technique again as I work the kinks out. On the other hand, I do like the way this turned out and I've got a few more ideas up my sleeve to try out now so I guess you could say it's a win-win! I call this manicure Holo Powder snowflakes because well, that's just what it is. 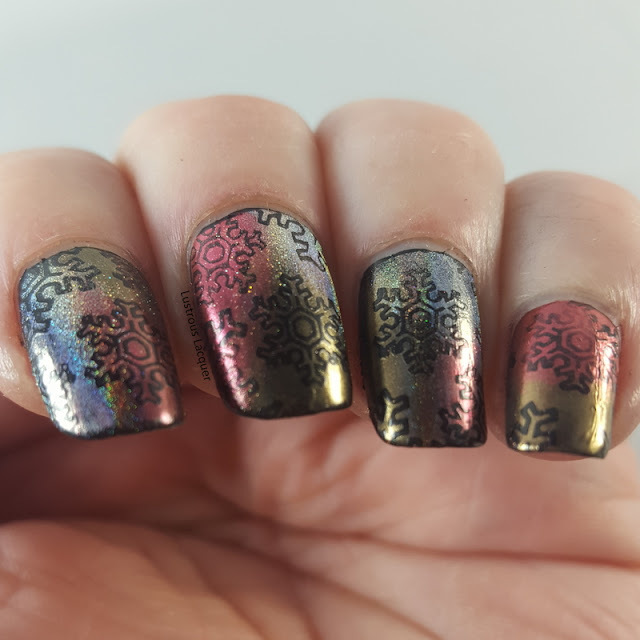 Snowflakes stamped onto my nails and holo powder burnished over them. Yeah I know, I'm not very creative when naming my manicures or blog posts. It's one of the things I'm working on. To create this look I started with a base of Sinful Colors Black on Black and waited for it to dry. After that, I applied my G-Force X from Super Chic Lacquer (my secret weapon when it comes to regular polish and holo pigments) to my nails and Simply peel from Bliss Kiss to protect my cuticles. 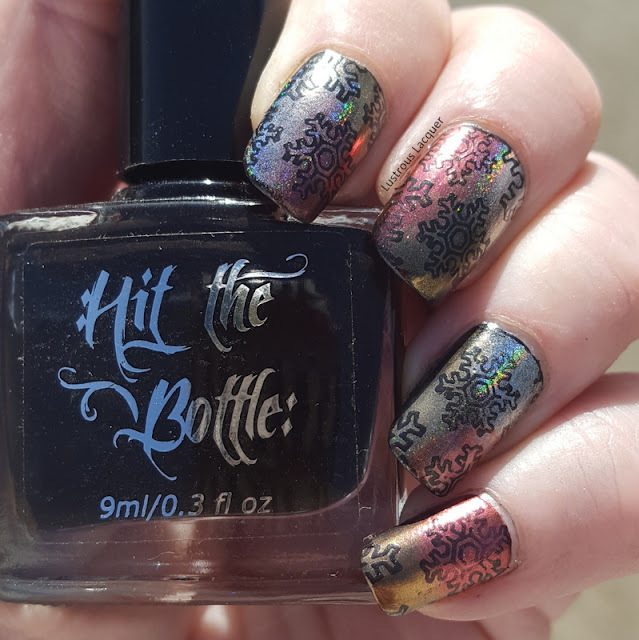 I stamped with Hit the Bottle As Black as Night and the snowflakes are from image plate UR Beautiful-16. I've had this plate for awhile but it's only been used recently and frequently, to be honest. I got the opportunity to go to a lock-in for a local girl scout troop and paint nails. At least half of the girls picked this plate to use. It was kinda cute and a lot of fun. But after 4 hours of painting nails, I have a new found admiration for nail techs. I know it's not easy to see in each photo but I used 3 colors of holo powders in this look. I wanted to use 4 but found out I don't have a green in my stash. I'll have to remedy that soon. Each powder is from Born Pretty Store and are item number's 33256 (Silver Holographic), 39224-2 (gold holographic) and, 39324-8 (Red Holographic). I randomly burnished each color onto my nails trying not to create a pattern. I was hoping that the powders would blend just a bit better to create more of a gradient look but the gold wanted to cover up the red so any hope of a gradient was quickly dismissed. I'll have to see if I can find a different way to get a gradient effect with the powders, or if you have any tips or ideas feel free to share. Also if you'd like to pick up any powders for yourself used code LAUNX31 to get 10% off your purchase from Born Pretty Store. I hope you enjoyed today's nail art look. Let me know what you think in the comments. As Always thanks for stopping by and Happy Polishing!